There are two kinds of people in the world. 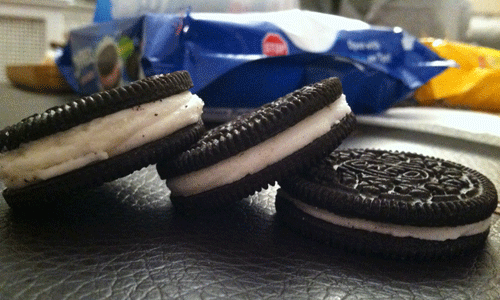 Those that love Oreos and… um… wait, does anyone not love Oreos? No right? Okay, so we have established that Oreos have the highest approval rating of anything in the galaxy other than, like, oxygen. That’s because they are the simplest dessert ever. That and they taste better than any gourmet dessert ever invented. As finals week approaches and/or currently occurs for college students everywhere, we all will reach for our favorite comfort food to let us know it will be okay. With two large essays in front of me I elected not just for Oreos, but for Mega Stuf Oreos. 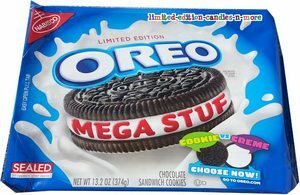 What are these so called creations and what makes them “Mega Stuf” you ask? If you aren’t screaming with excitement right now then I am ashamed. That massive beauty on the left is the Mega Stuf Oreo. It’s more or less a quadruple stuffed, a double stuffed with twice the creme. You can actually buy these things. I’m eating one as I type this. They are literal magic. A wizard literally just appeared at my bedside and gave me a high five while playing a guitar solo. These are the type of Oreos that would cause all wars to cease in an Oreo filled utopia. You have a duty. Purchase these delicious diabetes disks or you will prevent world peace. Them’s the stakes. Your move, brochacho.